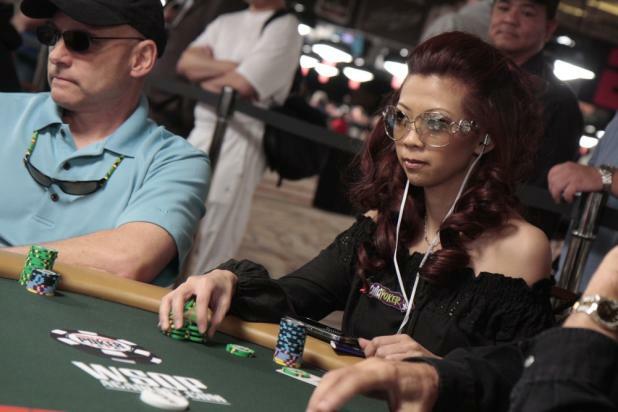 Liz Lieu was one of 2,601 players on Day 1a of Event #3 ($1,000 No-Limit Hold'em). When Lieu isn't traveling the world playing poker tournaments, she often spends her time doing charity work, including frequent trips where she gets hands-on providing aid to help out her birth country of Vietnam. 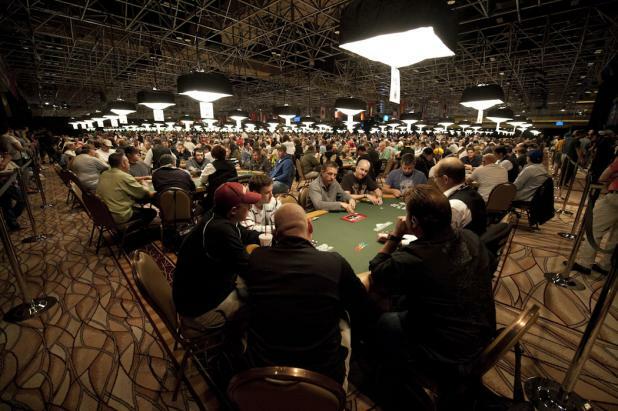 When the WSOP first moved to the Rio in 2005, players were amazed at the size of the Amazon Room (38,000 square feet). This year, the WSOP has taken over the Pavilion Room as well, which, at 58,000 square feet, is 50% larger than the Amazon Room. It's impossible to capture the entire room in a single photo, though a fisheye lens certainly helps. 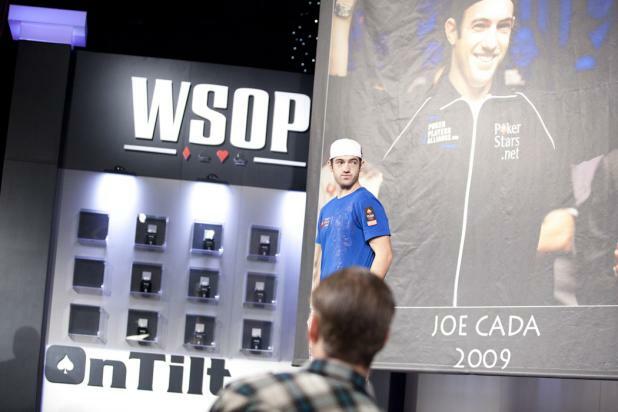 Every WSOP Main Event winner has a banner hanging in the Rio to commemorate their accomplishment, and Joe Cada's banner was unveiled as part of the "Shuffle up and deal" ceremony before the start of Event #3 ($1,000 No-Limit Hold'em). Reigning WSOP Main Event champion Joe Cada returns to the Rio and is welcomed by tournament director Jack Effel. Cada is on hand to announce "Shuffle up and deal" for the first massive-field event -- Event #3 ($1,000 No-Limit Hold'em), which attracted more than 2,600 players on Day 1a. Erik Seidel (left) and Phil Hellmuth sit side-by-side on Day 2 of Event #2 ($50,000 Player's Championship) as fans pack the rail. 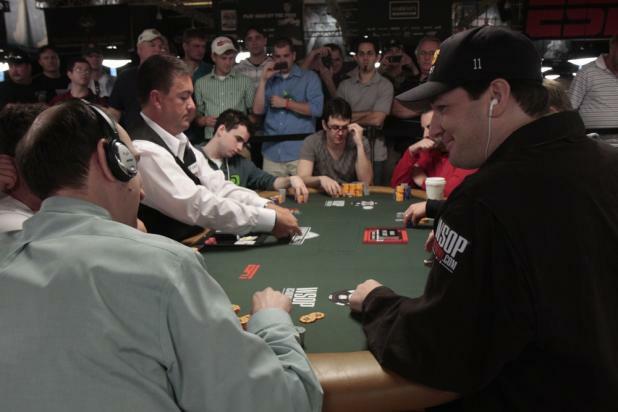 Between the two of them, they have 19 World Series of Poker bracelets -- Hellmuth would love to win his 12th to extend the career record, and Seidel could win his 9th to tie the legendary Johnny Moss, who won three out of the first five WSOP Main Events (1970, 1971, 1974). While the media covers poker like a sport, few sports would have one of their original legends playing at the highest levels well past the retirement age. 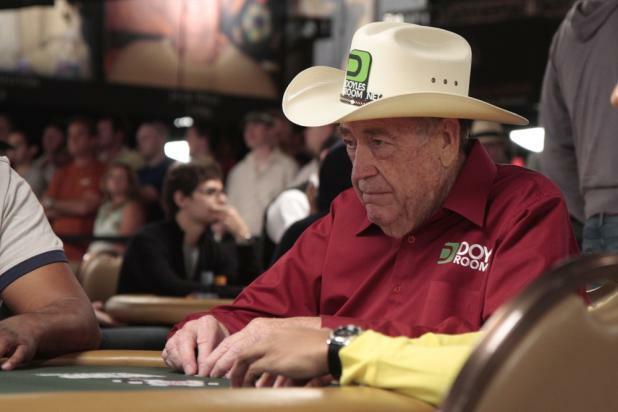 Doyle Brunson is 76 years old as he competes with the best all-around high-stakes poker players in the world in Event #2 ($50,000 Player's Championship). 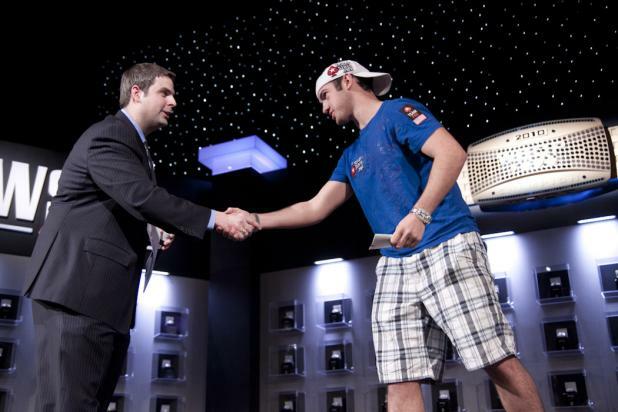 Brunson, who has 10 WSOP bracelets, final tabled this event when it was first held in 2006. While most poker fans know they can find the World Series of Poker on ESPN (in the U.S.), they don't know that the company responsible for producing the show is actually 441 Productions. 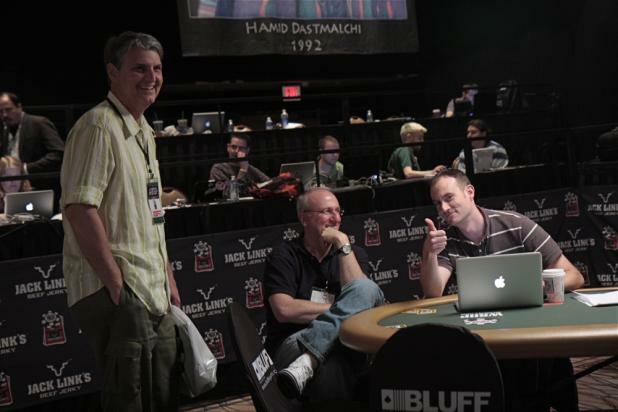 Executive Producer Matt Maranz (center) and Senior Producer Dave Swartz (right) chat with on-air announcer Lon McEachern during the $50,000 Player's Championship, which will be televised on ESPN. 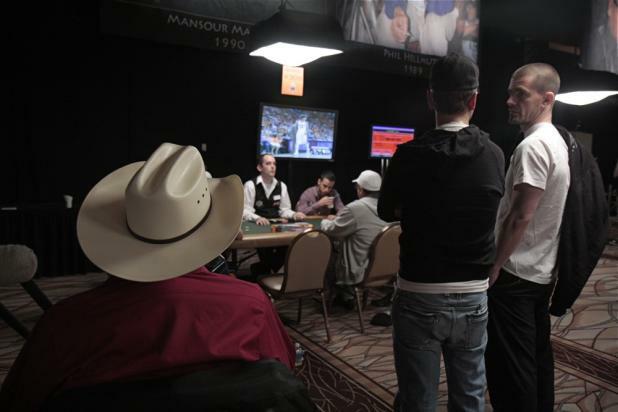 From left to right, Doyle Brunson, Daniel Negreanu, and Gus Hansen watch the first quarter of the LA-Phoenix game in the NBA Finals. Hansen has already busted from the $50,000 Player's Championship going on around them, but Brunson and Negreanu still have chips left at their respective tables. 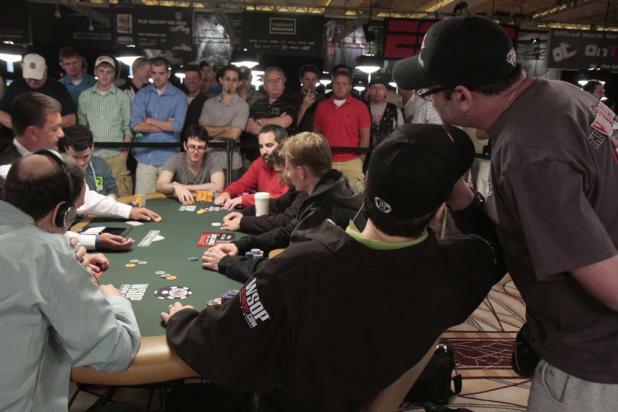 Mike Matusow wanders over to Phil Hellmuth's table for a brief chat between hands on Day 2 of the $50,000 Player's Championship. The $50,000 Player's Championship is a fan's delight, since every table is stacked with famous players. Daniel Negreanu is one of the most popular, and he often takes time to sign autographs and take pictures with fans on the rail.